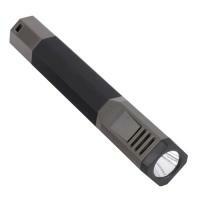 The Inova Radiant AA LED flashlight packs impressive brightness in its compact, water resistant body. The Radiant features two modes, low and high, with a light output of 13-150 lumens and a visibility range up to 509 feet. This model incorporates Inova's patented optical system, producing a concentrated beam of white LED light. Inova Radiant compensates for heat and maintains superior functionality through its vital ventilation system. Inova's Radiant LED flashlight stands up to rugged activity with its quality, injection-molded polycarbonate body and slip-proof rubber-coated handle. You'll never be left in the dark with this device and its run time of over 17 hours, powered by two included AA batteries.